Avia Solutions Group, a WSE listed global provider of one-stop-shop aviation business solutions, has recently signed a cooperation agreement with the largest Russian state-owned holding company Rostec. Both companies have agreed upon establishing a joint business venture and implementing the project of the development and management of the fourth Moscow airport hub on the basis of existing Ramenskoye aerodrome. Avia Solutions Group is to invest 1 billion RUB (over USD 30 million) into the company’s share capital and control up to 75% of the newly established company stocks. The Russian industrial giant Rostec will contribute to the project by bringing in the land and real estate currently under its ownership in the territory of Ramenskoye aerodrome. In seven years’ time the total investment into the development of the fourth airport in Moscow is expected to top USD 236 million. Avia Solutions Group together with Rostec, which currently unites more than 600 companies and employs over a million of people, will conduct the Ramenskoye development project in three stages, planned to be completed in 2014-2019. At the moment the airfield of Ramenskoye, also known under the name of Zhukovsky, has two landing strips one of which is the longest in Europe (5.4 km). In order to transform the airfield into a full-fledged international airport the company needs to build a passenger handling complex and establish all the appropriate services. 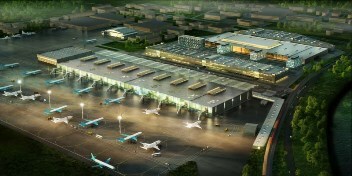 Therefore, in the first stage of development the existing facilities of Ramenskoye aerodrome will be supplemented with a brand new 7000 sq m passenger handling terminal (capable of serving up to 1.8 million of passengers per year) as well as short-term and long-term parking facilities. In the process of implementing the project local government institutions are expected to reconstruct the automobile road from the highway to the airport and, by 2020, connect Ramenskoye airport by rail. Avia Solutions Group has embarked on establishing all the required airport services as well as taking care of all the relevant licenses and permits. The first Russian airport specifically built to serve low cost carriers will start its activity as early as in the summer of 2015. “Moscow is not only the Russian but also the regional air transportation hub with airports serving millions of passengers each year. However, the existing three international airports in the capital of Russia are rapidly approaching the limits of their capacity. It is expected that in 2020 airports in Moscow will serve 96.5 million of passengers per year. What it truly means is that even upon the development and expansion of the existing infrastructure in the currently operating three airports the capacity deficit will reach 10 million. At the moment Russia is in the early stage of developing its market of full-fledged low cost carriers. The process has been further slowed down by the lack of appropriate infrastructure to serve such airlines,” commented Tomas Vaisvila, the Head of Aviation Infrastructure Development and Management at Avia Solutions Group and one of top managers at the newly established Rostec and Avia Solutions Group joint venture. According to T. Vaisvila, the aforementioned niche has opened due to the fact that the existing three airports in Moscow cannot offer favourable conditions to low cost carriers. 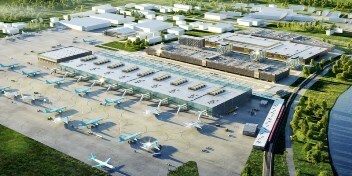 With the capacity to serve 12 million of passengers per year Ramenskoye International Airport will be the airport specifically tailored to meet the growing demand for low-cost air travels and the needs of such airlines in Russia. Moreover, with its extensive experience and unprecedented know-how of its subsidiaries Avia Solutions Group will significantly facilitate the process of acquiring the necessary licenses and establishing relevant services. What is more, the group will attract numerous customers which are currently the clients of its subsidiaries providing ground handling, technical maintenance and training services. A large share of activities conducted in the new airport will be also carried out by group companies. In the second and third stages of development the company is planning to build the second and significantly expand the first airport terminal. The combined area of both terminals will reach 60 thousand sq m raising the airport capacity to 12 million passengers per year. Furthermore, the airport will be expanded by adding a 5 thousand sq m cargo handling terminal, an aircraft maintenance centre, multi-storey car parks for 3240 automobiles, a 250-room hotel and two offices of 5 thousand sq m each. On top of that, the entire complex will be supplemented with a 100 thousand sq m shopping and entertainment mall. All the additional commercial objects will allow the new airport to generate more income from the non-aviation related activities thus compensating for the low airport service fees specifically tailored for the business model of low cost carriers. Upon the successful implementation of all three development stages Ramenskoye International will have attracted more than USD 236 million worth of investment and created 10 thousand new jobs. With the total of 240 thousand sq m of aviation and other infrastructure by 2022 the airport is expected to serve more than 20 million of international and regional passengers. “Today the largest Domodedovo airport in Moscow which serves around 28 million of passengers per year is valued at approx. USD 4.5 billion. Upon the successful completion of all three development stages Ramenskoye International will serve 12 million of passengers per year. We are highly positive about the future of the fourth airport in Moscow. For the implementation of this project we will use our existing circulating assets and borrowed funds as well as investments attracted via other financial means. In the early stages we are considering the possibility of attracting financial investors by issuing an additional stock emission or bonds which can be converted into shares. Regarding the future financial results of Avia Solutions Group we are highly optimistic about the project, although hard numbers are still early to forecast,’ said T. Vaisvila.